In a song on a later album, which I will cover down the line, Saxon asks, “Where were you in 79 when the damn began to burst?” I know I mentioned it before but I thought I should bring it up again because back in that year, Saxon were one of the bands who fired the first salvos at the damn. Their self titled first album was the weapon of choice and this album reminded me why I like to listen to up and coming bands so much. It contains a raw, gutsy, hungry sound that many heavy metal acts would possess when they were making their way up the ladder of success. The first track, “Rainbow Theme” may not be a throat grabber of an opening song but it does the job in turning your attention to the album. I love the guitar work on the second track, “Frozen Rainbow”as well as the Thin Lizzy influence on “Judgement Day.” The rest of the album would lay the ground work for the later success of Saxon from the unmistakable vocals of Biff Byeford to some impressive guitar work from the likes of Graham Oliver and Paul Quinn. Another track that definitely stands out for me is “Stallions of the Highway.” It shows why I have always liked this band so much. Back in 1979, heavy metal as we know and love it was still in its infancy, although back then, we didn’t realise how fast it would grow up. Saxon are one of the more unsung heroes of heavy metal. This first album shows the hunger that they had and metal bands after would acquire. 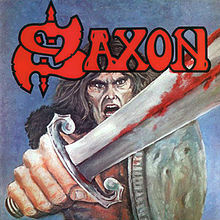 So in salutation, have a listen to the first album from a great British band, Saxon. Next post: I was going to save this until the end of my 1979 journey but as I am going to see AC/DC tribute band Hell’s Bells on Saturday, I thought I would make “Highway to Hell” my next stop. This entry was posted on February 5, 2013 at 7:58 pm and is filed under 1979, Music, Rock, Uncategorized with tags British, Classic Rock, hard rock, Heavy Metal, Heavy Rock, Saxon, The 1970s. You can follow any responses to this entry through the RSS 2.0 feed. You can leave a response, or trackback from your own site. This is a great album that often gets overlooked compared to the Saxon albums that followed. I love that there is a bit of a proggy feel to some of the songs like Frozen Rainbow. I know what you mean, I never heard of this album until I searched for it. 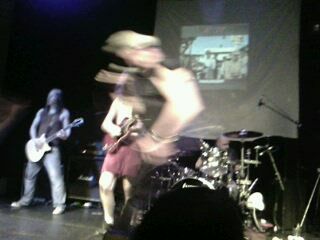 We could say that it is the bridge between prog rock and metal. It always surprises me how much of a Rush influence can be detected here.